I’ve made more headway on my bathroom makeover! And I was also driven to tears with some of the trim. 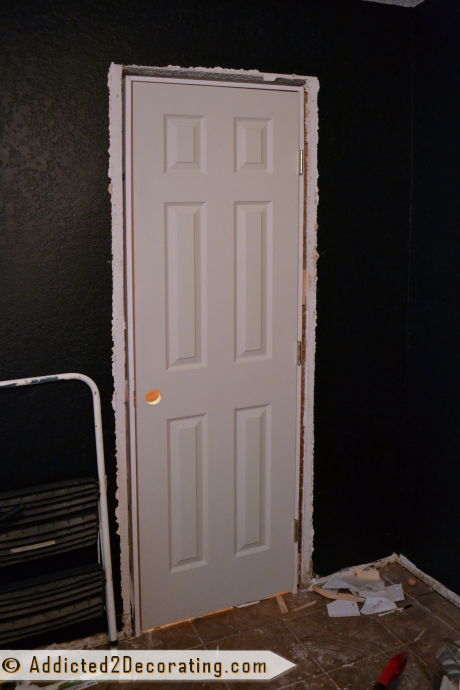 I got the old flat hollow core door and old trim removed, and got the new door installed. 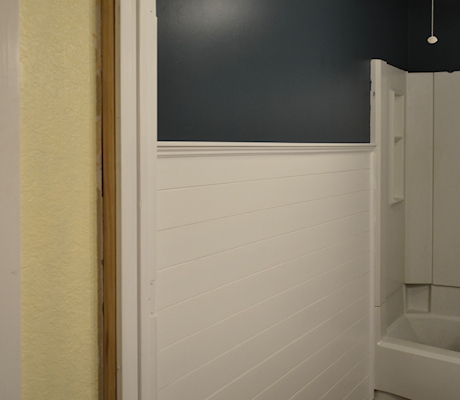 I installed the trim around the door inside the bathroom, but still have to do the trim on this side of the door. 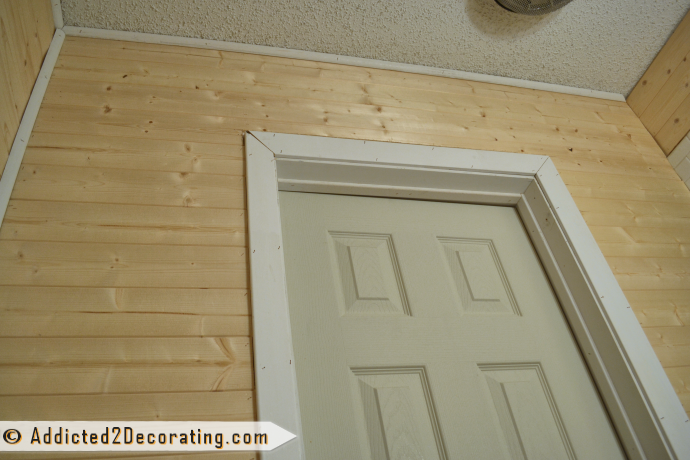 And after the door and trim were installed, I could finally finish up the plank walls. And I also got the new countertop made. It’s not actually attached yet, and it’s not even polyurethaned. I’ll do that after I get the walls finished. 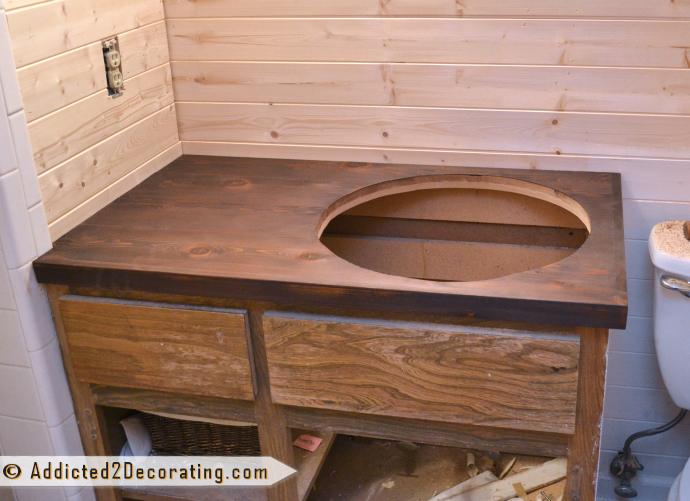 I used the same exact process for this countertop that I used for the other bathroom countertop, except that this time I used cedar 1 by 6 lumber instead of fence boards. They cost more, but were much easier to work with. Of course, right now it looks terrible next to all of the other wood tones (especially that terrible vanity…yuck! ), but you’ll just have to imagine it surrounded by light and bright finishes. And now, the not so pleasant part. The part that made me want to hurl my miter saw from the top of a tall building and watch it smash into bits. If you aren’t aware, let me explain that I am math challenged. Seriously. I count on my fingers to do the simplest math. I’m just a right-brained, creative person, and math just does NOT come naturally to me. Throw in geometry, and what you’ll get from me is a blank deer-in-the-headlights stare. Anything beyond the Pythagorean theorem confuses the heck out of me. So when I had to try to cut quarter round to go around the wall cabinet, I was about ready to pull my hair out. The vertical piece on the right had to meet with a piece that goes back towards the wall at a 22.5-degree angle, which meets with a piece that goes perpendicular to the back wall, which meets with a piece that goes to the left along the back wall, which meets with a piece that goes up, which meets with a piece that comes forward away from the wall, which meets with a piece that goes to the right parallel to the back wall, which meets with the original piece on the right. Lots of wasted quarter round. A temper tantrum that would rival that of any two-year-old. I’ll give it another try today, but honestly, I’m not feeling too confident that I can actually get this. Want to know the ironic part? I know many of you questioned my sanity when I decided to leave that wall cabinet instead of removing it. I had many reasons for that decision, but one of them was that I remembered the terrible time I had removing the cabinet from the other bathroom. It was so incredibly hard to do, and literally drove me to tears. So I thought just leaving it would be easier. And now my “easier route” has driven me to tears. Ha! Oh well. Too late now. I have to figure this out somehow. So tell me, have you ever had so much trouble trying to get the angles on trim right? Have you ever been driven to tears by trim? You’re not alone. I think we’ve all been there. I, too, am math-challenged, but I am an artist at plaster work! 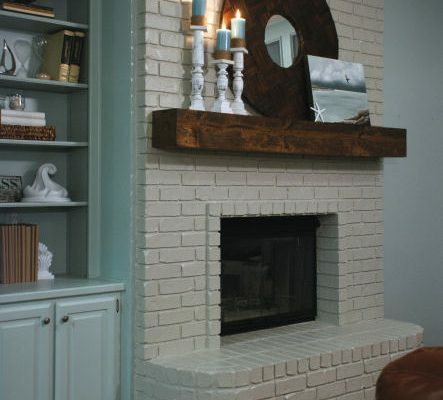 There’s nothing a little spackle can’t fix when it comes to trim you plan to paint anyway. If you’ve never heard of it before, you might want to look up a technique called coping (and a tool called a coping saw). It’s a fairly advanced technique that professional finish carpenters use (cause it makes a tighter joint) and it’s a bit more work (cause you basically have to do it with a little hand-saw), but it takes the geometry out of the equation, so for some people (not everyone, mind you…I probably wouldn’t have the patience to do it right), it’s easier. 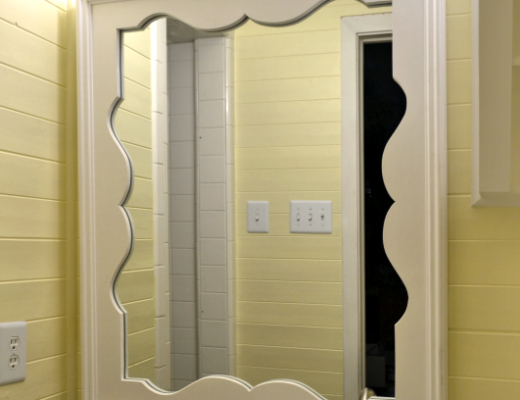 The basic technique is that when you have two pieces of trim (let’s say, crown molding) that need to come together at an odd inside angle, you cut one piece dead straight at a 90. The other piece, you cut to copy the contour of the first piece (following the contour of the trim itself but back-angling the cut slightly so they fit together more tightly). I suppose if you were doing a three-way joint like the one in your bathroom, you’d do the second and third cuts as a coping cut. Oh yes, I watched a pro install crown molding one time, and he used a coping saw. I was fascinated, and the corners fit together perfectly. I’ll have to get one and try it out. It doesn’t look too terribly complicated. And your dad speaks my language. I can’t even imagine what my projects would look like without wood filler and caulk!! 😀 I can assure you, no one would be impressed. I too am math challenged and would probably have torn the old cabinet out during my two year old tantrum 🙂 Sorry that you had such a difficult time with it and I am praying for you that today it all works out easily for you. Have a great day!! Awesome tools for crown molding? Please do share! The other day I was in Lowe’s, looking at the Kreg Jig accessories, and I noticed that Kreg has a crown molding tool. I don’t do crown molding, because I just can’t wrap my head around the angles. That tool might be just what I need. Is that what you use? I used that tool for crown molding and it comes with an angle finder to help you determine the angle you will need to cut your trim. I love it and cutting trim became a heck of a lot easier with it. It’s called Cut N Crown. There is no flipping of the board. It’s amazing. We met the inventor at a home show and I paid dearly for that equipment. You might find it cheaper online. http://cutncrown.com/ I love it. Now I just need a house that doesn’t already have crown! X2 for Justin’s suggestion of a coping saw. And kudos for him knowing what that tool was called! LOL I have used one for weird corners before and it does work, but I couldn’t have come up with what it was called. For quarter round molding, it would be terribly involved compared to a complex piece of crown molding and you really can sort of keep nibbling away at the back testing your fit until it slips over and meshes with the other piece. I think it’s easier than compound angles. quarter round molding would NOT be terribly involved – how important that one missing word was in my earlier response about coping saws! Anyway, I see from a later response that you figured out the math! Yay! I’m sorry you’re having so much trouble with these angles. Do you have a handy neighbor or friend who does construction that could give you a hand with this part? I actually did finally figure it all out on my own, so I’m making progress. Glad to hear it and can’t wait to see the finished project! I too hate molding with a passion. We just finished up a built in cabinet in our master from scratch. I swear the trim took as long as the thing took to build! We installed crown In our laundry room as “practice”. Lots of caulk and wood filler helped the job get done. we learned some Lessons. 1. We got a kreg jig and that angle finder tool. 2. We got a coping saw and will never do The flipping And Turning of crown again. 3. we also drank a lot of wine after the project was Completed 🙂 Good luck girl! That bathroom looks amazing!! Just wanted to be sure you weren’t planning to put the door back on.. doesn’t look like it would close w/ the quarter round in the way.. also, whenever my hubby and i run into issues w/ measurements or figuring something out, we first look on youtube, then sometimes we have to think out of the box.. like forget quarter round on that one part and just use a small flat piece of balsa wood (found at ac moore or michaels) that’s maybe 1/2 inch wide and you can even use hot glue to stick it up there.. then stain or paint it the same color as the walls so it blends in. Like what if you trimmed out the cabinet instead of using quarter round? so it was framed in like a picture frame (thus covering the gap).. that way you’re using flat pieces w/ mitered corners instead of fitting them w/ 45 degree angles.. don’t know if i’m explaining it right but i HATE figuring out angles.. just an idea to make your life easier! Kristi, do you really need molding on the right side of that cabinet? I’d just use some caulk, since it’s so close to the wall. 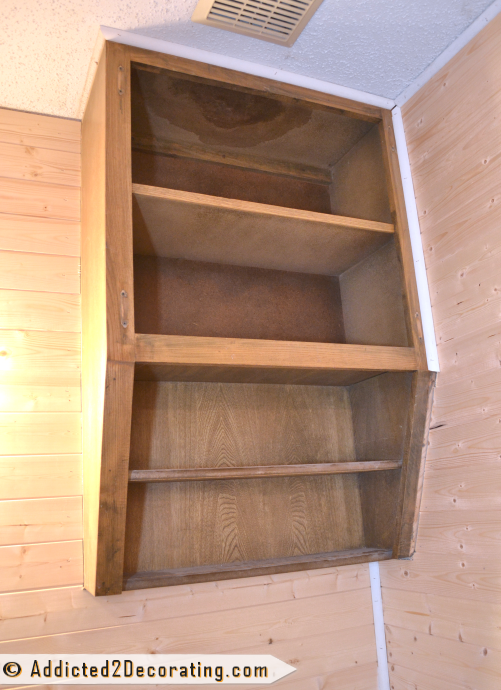 I can understand it around the top where it meets the ceiling, but not really the other parts of the cabinet. I really think it would look fine without the round. Maybe better? Caulking is my best friend!!! I starting crying when you were mentioning the perpendicular, vertical, horizontal ,22.5 degree, quarter round cuts whaaaaaaaa! Your work and website is incredible! Totally inspired! Keep it coming!